Of course, with such a soul-touching message, the movie could not help but make over $500,000,000. This figure does not include the profits made off of movie tie-ins like t-shirts, books, videogames and the like, of course. Apparently, the people who made WALL-E didn’t actually see the movie. So I moved over a few titles in the “W” section, where I found a copy of The Wizard, a 1989 film about videogames. The movie got good ratings in this month’s podcast, so I figured I should check it out for some good fun. 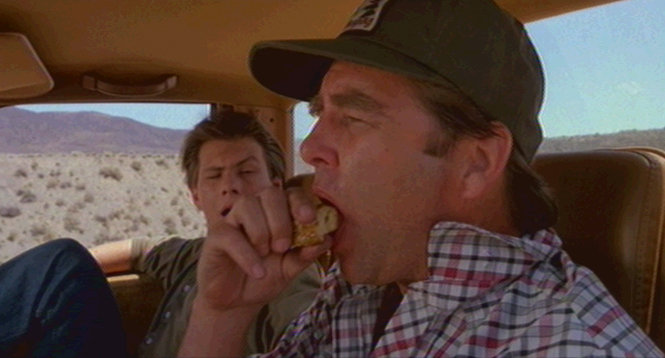 One of the most well-known scenes in the movie. The plot of The Wizard is that a boy named Corey (Fred Savage2) runs away with his emotionally-disturbed brother Jimmy to save him from being sent to a mental hospital. They team up with cool girl Hayley, and once they learn that Jimmy is a videogame wizard, they decide to go to Los Angeles to have him compete in the national videogame championships. They make it through various hazards, including a bounty hunter, in order to win the $50,000 grand prize and help Jimmy get past his psychological problems. So there you have it. The Wizard is an okay movie, even to people who don’t play videogames. And it has a dad with bushy eyebrows. It just so happens that, in this movie, the sport happens to be videogame competitions. I think this is my main impression of the movie: it’s your standard family-friendly sports movie. It’s not a blatant advertisement for videogames. Sure, there’s a scene where Lucas the Bad Guy shows off his Power Glove, but that is only ONE SCENE, less than five minutes long, and the genre demands that the Bad Guy has to show off his mad skills in an attempt to scare the hero. The Power Glove is never seen or mentioned again in the movie. If this is supposed to be an advertisement for the Power Glove, it’s a mighty poor one. Sure, the finale of the movie shows off the gamers playing Super Mario Bros. 3, but that’s because it’s supposed to be a twist—the gamers are testing their skills by playing a game they’ve never played before. And Super Mario Bros. 3 is still the best-selling game of all time, so it makes perfect sense that it’s used as “the big game” for the final round of the championships. As for claims that the movie gratuitously shows off the game, that’s nonsense. 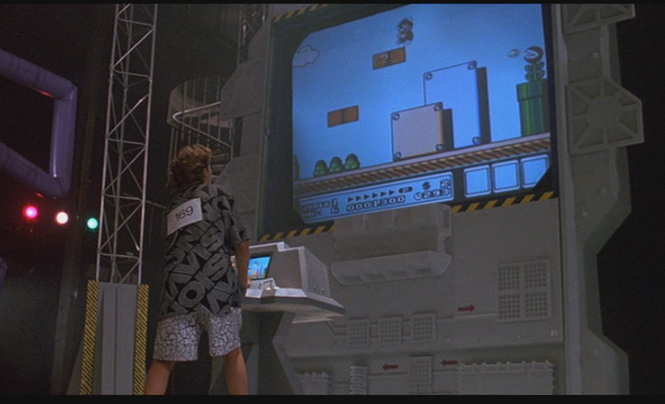 If you’ve played Super Mario Bros. 3, you’ll notice that 90% of the footage of the game shown in the movie is from the first level. When you want to show off a game, you don’t limit yourself to showing clips from the first level. Wow, I just ranted about how The Wizard isn’t a videogame commercial. A big picture of the big finale. 1. Am I the only one who noticed that the economy died shortly after WALL-E told everyone not to buy stuff anymore? Gee, now isn’t that a coincidence? 2. On the podcast, I said I did not know who Fred Savage is. It turns out that he’s one of the actors I recognize by sight, not by name. 3. In the movie, there’s a training montage where Jimmy plays through dozens of games. My mom recognized two games by name during this montage: Super Mario Bros. 2 and Teenage Mutant Ninja Turtles. So technically, she does know about the NES, but still, she doesn’t know a whole lot about it. 4. Lucas, the Bad Guy in this movie, has Tobey Maguire in his posse. Check the clip from the Power Glove scene if you don’t believe me. 5. This plot has been used not only in family films like The Mighty Ducks, but also in adult-oriented comedies like Dodgeball and Happy Gilmore. 6. Confession time: I enjoyed Super Mario Bros. 2 more than Super Mario Bros. 3.